Ingredients: Water (Aqua), Cetearyl Alcohol, Behentrimonium Chloride, Amodimethicone, Trideceth-12, Cetrimonium Chloride, Panthenol, Persea Gratissima (Avacado) Oil, Cocos Nucifera (Coconut) Oil, Hydrolyzed Silk Protein, Olea Europea (Olive) Oil, Ethylhexylglycerin, Cetyl Esters, Citric Acid, Disodium EDTA, Potassium Sorbate, Phenoxyethanol, Fragrance (Parfum). My swimmer daughter uses this after the pool chemicals strip her fine curly hair. Makes her hair super soft and easy to comb. Smells good too! 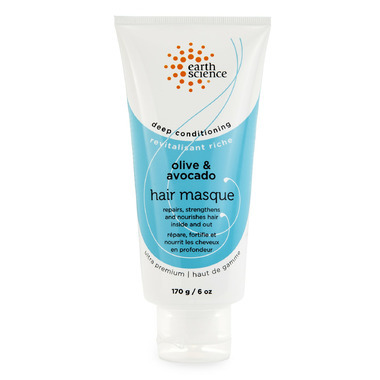 My daughter and I love how this hair masque makes our fine curly hair feel so silky and look so shiny and frizz free. I have very curly, fine hair. This is really the ONLY conditioner that works well for my hair. The down side is that it is apparently not as eco-friendly as it suggests it might be; (I think there may be silicone in the conditioner, unfortunately?) In addition, I am not terribly fond of the scent, but the drawbacks are still worth the benefits. I am someone who has tried just about every natural, eco-friendly conditioner on the planet, and this is the ONLY one that has consistently good results, so I tend to buy it in bulk when it is on sale. I love this hair mask. It leaves your hair feeling glorious and looking shiny and frizz free. Just make sure to wash it out properly. This mask is much better than any salon quality mask I've previously bought. I LOVE the smell of this. This product isn't as greasy as past conditioners I've used, I don't see a massive difference to my frizzy hair but I'm just glad it doesn't make it look oily. I've used this product 2 times now and I'm really happy with it. I have really dry end ( damaged caused by bleach) and it just softened my hair and make it manageable. Oh and it smells amazing! I bought the mini version which I loved so much that I had to buy the original size. I use it in the shower on my colored baby fine hair 3-4 times a week. This is the only mask what doesn't make my hair flat, but manageable. And the smell is just to die for! I use this in the shower twice a week after I condition my hair regularly. It works nicely to tame my frizz and make my hair soft. For me personally, it is not as natural as I would like so I wouldn't repurchase, but if that isn't a concern for you then try this out. Tried this in the travel size and loved it so much bought the regular size immediately. Makes hair soft and manageable, reduces frizz, but is lightweight enough not to take away volume or body. Scent is light and is not long-lasting so works great for me in every way! This is the best hair masque I've ever used. Perfect on my fine hair type. Also, I find it works better than the more expensive salon hair masques I've tried. This is a good, hydrating product. It is very natural, but I find it doesn't have quite enough of a hold on my hair to wear as a mask all day. Otherwise, the smell is great and the texture is nice! Great product that is free of all the ingredients you're looking to avoid in a hair product. I have thick curls and use this to tame my hair all day. I"ve noticed less split ends and tangles when I use this product! Highly recommended. My go-to for the last 4 years. I use a light conditioner all-over and I use this on my tips. I have super long, dark, normal thickness hair. I find that despite my hot tool use, this conditioner keeps my hair healthy and is great for working out tangles (if you have a bad tangle, I'd get this just for that reason) and it rinses out clean without residue. The smell is AMAZING, but as for how it works, nothing special. This is the best hair masque I've used so far. It smells great and transforms my hair - feels and looks smooth and is very easy to comb and blow dry. I have dyed blonde hair (i.e. damage) and it makes a significant positive difference. BUY IT! Great stuff. I have purchased in a total of 3. Only gave it a 3 because for the price, cheaper conditioners work just as effectively. Just got this today and used it in my morning shower it left my hair really soft and smooth and it smells pretty as well.